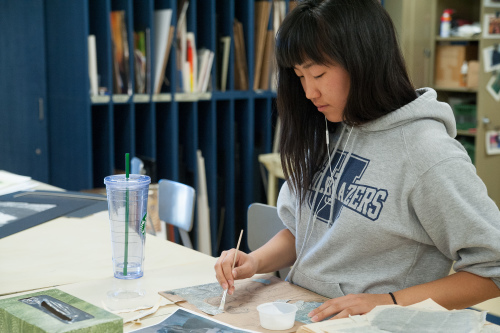 University High School offers a well-rounded arts curriculum with many options in both the fine arts (painting, photography, bookbinding, etc.) and the performing arts (music, theatre, etc.). To graduate from University High School, students must earn four credits (one credit is earned each semester) in art. University’s arts instructors are resourceful and imaginative and use a wide variety of resources from the local community to help personalize the curriculum for students. Student participation in the fine and performing arts is considerable. 100% of the student body enrolls in arts classes during their time at University High School. The inclusion of arts classes in the graduation requirements, the incorporation of grades for arts classes on equal ground as academic classes, and the provision for multiple opportunities for public presentation of work demonstrate the school’s support of the fine and performing arts. This course is an introductory studio art course that develops skills, principles, and techniques in drawing and other 2- and 3-dimensional mediums. Students will develop an understanding of the elements of art, basic vocabulary for describing visual aspects of their work, as well as a general understanding of the roles art has played throughout history and influences of the visual arts and culture. Demonstrations, slide lectures, group and individual critiques will be the primary tools utilized during class time to allows students to fully develop their technical understanding of 2 and 3-D space. This course will also introduce students to color theory and allow them to experiment with a variety of mediums. This is a beginning course focusing on the technical aspects of building handmade books. Along with learning several traditional book formats, the students will develop an understanding of the history of the book as a fine art object. Students are instructed on the use of tools and materials. Projects are designed to encourage exploration and experimentation of the book structure. Students will further develop their bookbinding skills in this semester-long course. They will not only work on more complex binding techniques, and structures, but will also take a more in-depth look of the book as a form of art. Students of this course will create works that focus on the artistic and creative side of an artist book. Projects are meant to push students’ understanding of the 3-D object and also give an introduction to interactive art forms. This studio course is an introduction to the fundamentals of traditional printmaking. There will be an overview of a wide range of printmaking techniques, with a closer introduction to five different printmaking processes: monoprint, collagraph, linocut, woodcut, and etching/drypoint. The emphasis of the course is learning the principles of design and developing and mastering basic techniques, with attention to composition. This approach includes working from both objective reality and subjective imagination. Demonstrations and slide lectures, as well as group and individual critiques, will be utilized throughout the course. The term alternative process refers to any non-traditional or non-commercial printing process.In this advanced studio art course, students will take a more in-depth look into the printmaking medium using non-traditional formats. Students will also investigate alternative methods and materials used in printmaking, as well as experiment with a variety of printing surfaces, including making their own paper. Discover your inner jeweler and explore the basics of metalsmithing and jewelry making while creating one-of-a-kind pieces. This class will teach the fundamentals of basic jewelry making, workshop safety, and tool identification. Explore the basic skills of metalsmithing and fabrication such as how to saw, file, texture, forge, rivet, and solder. This course is an investigation of the principles and techniques in sculpture and three- dimensional form. This course will also introduce students to structural theory and allow them to experiment with a variety of three-dimensional mediums including but not limited to paper, wood, wire, and clay. We will explore and examine the function of space, volume, mass, plane, and line. Sculptural issues will be explored through the solution of design problems. In this semester-long course, students will receive an introduction to the basic techniques of stained glass making, leaded and copper foil methods, as well as three-dimensional construction techniques. Students will practice drafting patterns, cutting glass, painting and staining, etching, grinding, and soldering the glass together. In addition to primarily focusing on stained glass, students will also receive instruction on glass blowing, hot glass shaping, fusing, and slumping techniques. This course will also study the history, iconography and significance contained in stained glass windows. Students will gain a new skill through the creation of their own works of glass art. This course is designed for students with basic drawing skills who would like to further develop their technique. Throughout the semester, students will be building upon the basic fundamentals of drawing: line, value, form, gesture, and spatial illusions. Emphasis will be on understanding and applying these basic principles through a variety of projects and exercises using charcoal, pencil, watercolor, acrylic and oil paint. This course introduces students to the variety of materials and processes involved in hand produced textiles. Throughout the semester students will explore the methods in which textiles are constructed, make their own textiles, and also learn the basics of how to sew. We will begin with the original fiber, spin it into yarn, weave it, knit it, crochet it, etc. There will also be a component of the course that is dedicated to learning how to use a sewing machine as well as how to hand sew fabric. Students will experiment with surface design on textiles using dyes, embroidery, and other approaches to fabric finishing. This course will continue to build upon many of the techniques students learned during Textiles I. Students will be encouraged to further develop and hone skills such as spinning yarn, dyeing with natural materials, weaving, knitting, as well as embroidering and sewing. Various new dyeing processes will be introduced as well as approaches to manipulating fiber and fabric. This course is geared toward students who are interested in both design and construction of a functional form. Using three keystone projects, students will begin with an original idea and then ultimately bring that initial design to life. Throughout the semester they will develop designs using Adobe Illustrator and then screen-print their design on an article of clothing, they will design and then create a pair of leather sneakers for themselves, and they also will digitally construct and then 3-D print a pair of sunglass frames. This class is designed to introduce students to a range of approaches in digital illustration using a tablet. Students will explore the fundamentals of design in this digital platform and gain an understanding in how to translate a visual idea into a digital sketch through the use of line and space. Specific projects will aim to teach students the basic technical understanding of this digital platform as well as further develop their drawing skills. Each student will be provided with a tablet that they will then get to keep. This class is an introduction to the fundamentals and principals of black and white photography. Throughout the semester students will learn to process their own film, how to operate a manual SLR camera, and also how to create a well composed and aesthetically pleasing image. The primary focus of the class will be on traditional black and white film, and students will be developing their own film and processing their own prints. Students will be supplied with a camera and film but will be responsible for their own developing. In this class, we will start the semester by shopping local antique stores, flea markets, camera shops, eBay and the Internet for old cameras. After the purchase we will learn how to use and fix the cameras. We will also research the cameras and learn about their history. This course is a precursor to the senior year AP Drawing, Photography, or 3-D portfolio. It allows students to gain additional one-on-one attention with an instructor and also develop their skills beyond the introductory and advanced courses offered. Throughout the semester students will be exploring the Breadth portion of the final AP portfolio. Journaling will be a major component of the class as well. Goals for the semester are for students to develop understanding and experiment with a variety of materials, techniques, and concepts. Students also will regularly discuss and critique artwork with peers and the instructor. Throughout the semester students will be exploring the three primary components of the AP portfolio; Quality, Concentration, and Breadth and create 24 well-executed works. Each piece should display a broad understanding and mastery of a variety of materials, techniques, and concepts and investigate art in all aspects (historical, cultural, and technical). Students will develop mastery in concept, composition; and execution of 2-D design and be able to discuss artwork through critiques with their peers and instructor. As a survey course, the material is approached as an introduction to the discipline. The primary goals of this course are for students become versed in the visual language of art and simultaneously encourage further study in college. In preparation for the AP Exam students will be able to write essays and complete exams defining vocabulary from the field of art history, fully identify specific works of art (title, artist, media, culture, artistic movement or period, and date), and analyze composition, symbolism and psychological function of those works of art. This course is geared primarily for seniors who may possibly be thinking about a career in photography or the graphic arts. Throughout the year students will choose a selected portfolio that is appropriate for their personal goals in the art program. They will explore in depth the three primary components of the AP portfolio; Quality, Concentration, and Breadth and in April will select 24 of their strongest pieces to submit to the College Board. Students should investigate art in all aspects (historical, cultural, and technical) allowing them to make informed and critical decisions while creating their own works as well as develop mastery in concept, composition; and execution of printing and editing digitally. Throughout the semester the class will have regular critiques with their peers and instructor to guide them along the process. The AP 3-D goals for students throughout the course of the year are to develop creative and systematic investigations into the formal and conceptual issues in 3-D design. By the end of the year, they should be able to demonstrate versatility with techniques, problem solving, and application of mediums within the development of their work. Throughout the semester, students will be presented with a variety of problems, which they must solve three-dimensionally in creative and thoughtful ways. In addition to this, they will be challenged with a variety of media. Students will also investigate current and past three-dimensional artists and develop an understanding of the place of sculpture within the context of art history. This course is designed for students in any grade who desire to participate in an instrumental music ensemble. Students must be able to play a woodwind or brass instrument and be able to read music. A variety of music styles will be studied and performed, including traditional concert band music, jazz improvisation, chamber music, and symphony orchestra literature through collaboration with the String Orchestra and Percussion class. Students at all skill levels will improve their music theory, music history, and performance skills through a differentiated curriculum. This course is designed for students in any grade who desire to participate in a vocal music ensemble. There is no prerequisite, although the ability to read music is strongly encouraged. Students will study music theory, learn vocal techniques and basic musicianship, sing in different languages, and study the cultural and historical context of the music. Performances will include traditional choir music as well as small groups (duets, trios, quartets).There are also accompanying opportunities in Choir for students who play guitar and piano. Students interested in this accompanying opportunity should obtain teacher approval and register for Choir. This course is designed for students in any grade who desire to participate in an instrumental music ensemble. Students must be able to play an orchestral string instrument and be able to read music. A variety of music styles will be studied and performed including string orchestra, chamber music, solo, and symphony orchestra literature through collaboration with the Wind Ensemble class. Students at all skill levels will improve their music theory, music history, and performance skills through a differentiated curriculum. Advanced Musicianship is a semi-independent study and runs concurrently with Wind Ensemble. This course is designed specifically for students with a high level of musical knowledge, experience, and ambition. Students must be able to play a woodwind or brass instrument at an advanced level and also exhibit a high level of motivation. In addition to performance with the Wind Ensemble, students will study important solo literature and research famous composers and performers who were influential in the development or expansion of their instrument. Private lessons are strongly encouraged. Two years of prior high school wind ensemble experience and teacher recommendation is required. Advanced Musicianship is a semi-independent study and runs concurrent with String Orchestra. This course is designed specifically for students with a high level of musical knowledge, experience, and ambition. Students must be able to play an orchestral string instrument at an advanced level and also exhibit a high level of motivation. In addition to performance with the String Orchestra, students will study important solo literature and research famous composers and performers who were influential in the development or expansion of their instrument. Private lessons are strongly encouraged. Two years of prior high school orchestra experience and teacher recommendation are required. Advanced Musicianship is a semi-independent study and runs concurrent with Choir. This course is designed specifically for students with a high level of musical knowledge, experience, and ambition. Students must be able to sing at an advanced level and also exhibit a high level of motivation. In addition to performance with the Choir, students will study important solo literature and research famous composers and performers who were influential in the development or expansion of vocal performance. Private lessons are strongly encouraged. Two years of prior high school choir experience and teacher recommendation are required. This class is designed for students who wish to learn how to read and play music or who would like to enhance their skills as musicians. The class will gain its knowledge of music with the aid of pitched and non-pitched percussion instruments. This is truly a beginning/early intermediate class. 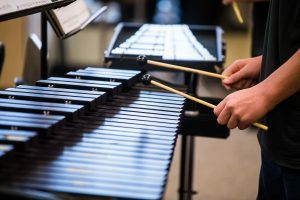 Students who have two or more years of experience as a percussionist should enroll in Percussion Ensemble. Students who excel in Introduction to Percussion may register for Percussion Ensemble in subsequent semesters with teacher approval. This course is designed for students in any grade who desire to participate in an instrumental music ensemble. Students must be able to play a percussion instrument and be able to read music. A variety of music styles will be studied and performed, including traditional percussion ensemble music, jazz improvisation, chamber music, and band and orchestra literature through collaboration with the String Orchestra and Wind Ensemble classes. Students at all skill levels will improve their music theory, music history, and performance skills through a differentiated curriculum. Introduction to Music Technology is an introductory course in the principles of audio and sound recording. In addition to music theory (through basic chord progressions), students will study sound waves, acoustics and the audio spectrum, console and signal flow, equalization and compression, microphones and their placement, effects, digital audio formats, and MIDI basic concepts through collaborative and individual projects. This course is an improvisation (improv) acting class, and improv is for everyone. Improv is a method that anyone can learn and practice and is considered to be the core of actor training. Improv teaches one to be present, listen, co-create, trust one’s instincts, and develop teamwork. Improvisation also builds self-confidence and self-awareness. This course will be taught through improvisational games and exercises, as well as studying other improv performers. This class is not just for those wanting to be involved in theatre, but for anyone wanting to learn these skills that could benefit any career choice. At the end of the semester, there will be an improv performance. In this course, students will dive deeper into the art of improvisation, furthering character development and plot lines while gaining confidence in their craft. Acting for Everyone is a prerequisite for this course. This course is designed to deepen the understanding and appreciation of the theatre arts as a whole. The primary focus will be on how to produce and mount a theatrical production. Students will develop an understanding of theatre production vocabulary, as well as the many and varied roles required to deliver a quality production, from the design to the marketing that bring a story to life on stage. Students will learn set design, lighting design, sound design, and costuming and make-up skills. In lieu of a final exam, students will pitch a mock production. In this course, students will learn the art of filmmaking from start to finish. This project-driven course will allow students to write screenplays, study film history, learn about storytelling, explore cinematographic elements, hone video editing skills, employ special effects, and create short films. Yearbook is a semester-long course that focuses on the study and practice of journalistic writing and photojournalism. Students in this class will be responsible for the production, publication, and marketing of the school yearbook. All aspects of yearbook production will be covered including graphic design, copywriting and editing, photographic composition, interviewing techniques, ad sales, and organizational and management skills. Students may take yearbook as a year-long class and will have the opportunity to focus more on digital design during the second semester. This course will study and practice the use of journalistic writing and photojournalism with a focus on the digital design aspect of journalism. Students will be responsible for completing Elements, the school yearbook. In addition, students will dive into the collection, creation, and presentation of audio, video, and photographic images. Students will learn the best practice in all three areas of digital media. Projects in this class will include the use of digital video and still cameras as well as photo editing software. The content created by this class will be published as part of the yearbook as well as on the school’s website. This course will explore the history of cinema. Students will be introduced to the major people, motion pictures, movements, and themes that have created our common language of film. We will center the course around the chronological development of cinematic technologies and methods, which will allow us to contextualize and trace the history of the art form. The social implications and significance of the medium will also be central to our understanding. Assessments will include film journals and formal essays of varying length. Students will also get the chance to apply their understanding as they create short films of their own.